Mr Digerati: Wardriving: Why don't they educate properly?? Wardriving: Why don't they educate properly?? Well.... if you want it quick.. picture this.... 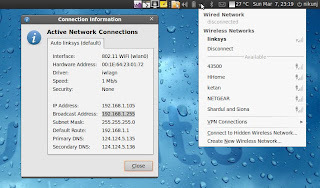 I was generally sitting in a friend's apartment and when I chose to connect to any available network [don't get intimidated by the UI: its Ubuntu 9.10].. It successfully gave me the IP via DHCP and I could open pages... surf web. All Good right? ... not my fault if someone is not using a LOCK in his HOUSE (but doesn't mean that give me liberty to go Steal). I could've acted like a parasite on that connection (eating all their bandwidth) without this poor guy even knowing what's wrong... but what if someone sends a Hate-Mail to the President using your access-point (without you even knowing!! Think: You got arrested for "nothing". Such a Shame!!) or trigger some terrorist activity? Otherwise you can have a secured connection, have a password to connect to the accesspoint, without which no machine can't get connected. PS: My other posts below tell us how to ensure your accesspoint is secured connection. PPS: Why don't they educate properly? [The KNOL] What if it wasn't called CRAP?